Think-tac-toe is a strategy that harnesses the visual pattern of the tic-tac-toe game to broaden student understanding of instructional content, challenge students who already have some mastery of a subject, and provide a variety of means to assess student mastery in a way that is fun and unusual. A teacher would design a think-tac-toe assignment to support the purpose of the study unit. Each row could have a single theme, use a single medium, explore the same idea across three different media, or even explore a single idea or subject across different disciplines. Differentiation is the practice of modifying and adapting instruction, materials, content, student projects, and assessment to meet the needs of diverse learners. 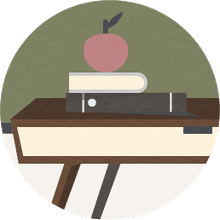 In a differentiated classroom, teachers recognize that all students are different and require varied teaching methods to be successful in school. But, what does that mean in real terms that a teacher can put to use? Enter Mary Ann Carr, author of Differentiation Made Simple, an educational resource that she describes a "toolkit" for providing different methods—or tools—for presenting materials in a way that students understand. These tools include task cards for literature, creative writing, and research; graphic organizers; guides to creating differentiated units; and tic-tac-toe learning tools, such as think-tac-toe. Indeed, think-tac-toe is a kind of graphic organizer that provides a way for students with different learning styles or special needs to organize content so that they can understand and learn. Put simply, "Think-tac-toe is a strategy that allows students to chose how they will show what they are learning, by giving them a variety of activities to chose from," notes teaching blog, Mandy Neal. For example, suppose a class is studying the American Revolution, a subject that is taught in most fifth-grade classes. A standard way to test whether students have learned the material would be to give them a multiple-choice or essay test or have them write a paper. A think-tac-toe assignment could provide an alternative way for students to learn and show what they know. With think-tac-toe, you could give the students nine different possibilities. 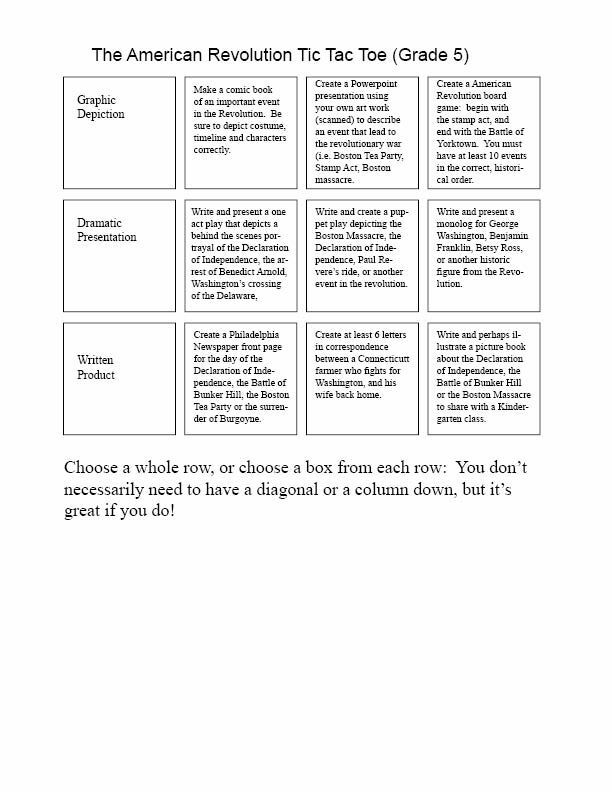 For example, the top row of the think-tac-toe board would allow students to choose from three possible graphic assignments, such as making a comic book of an important event in the Revolution, creating a computer graphics presentation (including their original artwork), or creating an American Revolution board game. A second row could allow students to express the subject matter dramatically by writing and presenting a one-act play, writing and presenting a puppet play, or writing and presenting a monolog. Students who learn by more traditional methods could present the material in written form listed in the bottom three boxes of the think-tac-toe board offering them a chance to create a Philadelphia newspaper about the day of the Declaration of Independence, create six letters of correspondence between a Connecticut farmer fighting under George Washington for independence and his wife back home, or writing and illustrating a children's picture book about the Declaration of Independence. You could assign each student to complete a single assignment listed in one box, or invite them to try three assignments to score a "think-tac-toe" earning them extra credit. What Does it Mean to Be a Visual Learner? How Are Rubrics Used to Score Classroom Assignments?